In January, my goal of the month was to waste less. I was tired of throwing out leftovers or unused portions of food, and I think I did a pretty good job being mindful of my ingredients and reusing extras in other recipes. Mr. O and I use a lot of garlic and onions in our food. I’ve seen (and pinned) a few pictures on Pinterest which show people regrowing vegetables, and I’ve been curious about it. About a week ago, Mr. O and I had a dumpling making party (aka he and I rolled dumplings in the dining room). We use green onions in our dumpling stuffing, so I decided to keep the ends and see if I could use them to regrow green onions like the pin I found on Pinterest. I wish I took a picture every day, because this growth spurt has been incredible. I’ll do a follow-up post after I cut these onions down with a day-by-day growth of the onions, but for now, I will show you the seven-day growth of this bunch. 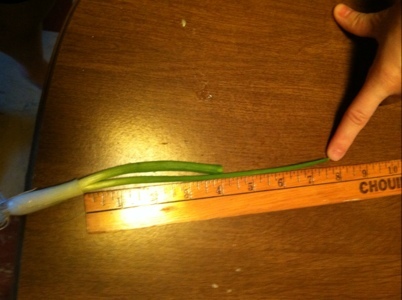 You can easily see the where the onions started on August 5th by the thick line on the white stem. The picture below was taken only four days later on August 9th. I wish I had measured the growth, but I didn’t. I think it is safe to say there is about 4 inches of growth. The next picture was taken on Saturday, August 11th. As you can see, there is about 6.5 inches of growth in just six days (and at least 2 inches in two days). And finally, this last picture was taken yesterday. Look at the difference in just one more day! 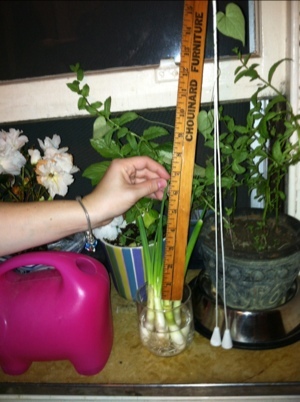 Who knows how long we will be able to use these green onions. I think I will be cutting them in the next couple days. 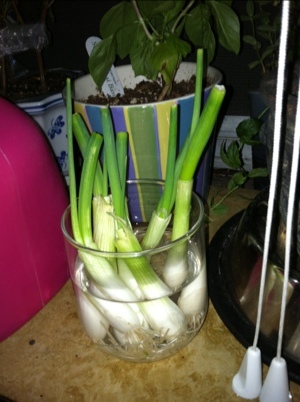 I’ll try to let you know how long I can keep these onions regrowing. 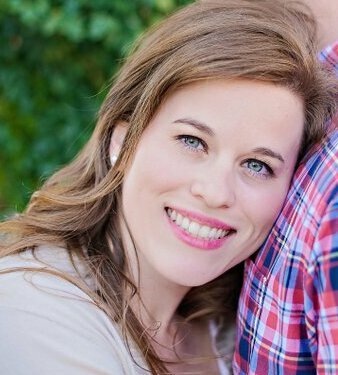 This entry was posted in Pinterest. That is amazing! I have to try it the next time we buy scallions … and this is great, because we go through a lot of them. I had no idea one could do this! Me either! I saw it on Pinterest, but I didn’t really think it would work. I vaguely remember my mom doing something like this with us when we were kids. It was either an onion or garlic… Garlic is going to be what I try next!